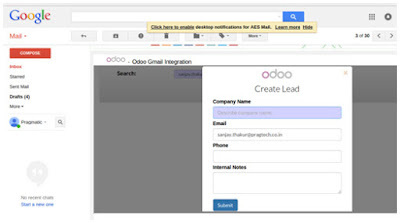 Pragmatic has created the much required automation and seamless integration of Odoo with Gmail Plugin/ extension. We had used the Gmail Contextual Gadget to integrate with Odoo and create Leads/ Contacts/ Customers/ Support Tickets and much more at just a click of a button. Gmail Contextual Gadget (Gmail plug-in/extension): Contextual gadgets are applications that are displayed at the bottom of individual email messages and are triggered by contextual clues, such as the contents of Subject lines, sender and recipient email addresses, and more. Contextual gadgets are applications that are displayed at the bottom of individual email messages and are triggered by contextual clues, such as the contents of Subject lines, sender and recipient email addresses, and more. For example, Gmail already provides a YouTube contextual gadget. If the body of an email contains a link to a YouTube video, a clickable thumbnail view of the video appears at the bottom of the email. Contextual gadgets support the gadgets. * API as well as an additional API that allows them to extract contextual clues. Contextual gadgets in Gmail provide a way to integrate functionality into the workflow at precisely the point where it is useful. A Gmail contextual gadget is a gadget that is triggered by clues in Gmail, such as the contents of Subject lines and email messages. Develop a Gmail contextual gadget for use within a single organization’s Google Apps domains (an in-house application). List the gadget for sale on the Google Apps Marketplace. Detects contextual clues in email, determines which types of content will trigger the gadget, and passes the triggering content to the gadget. An extractor does this by comparing a given regular expression to content in one or more given parts of each individual email message (From:, To:, etc.). In the YouTube gadget, the extractor checks the subject line and body of the email for strings that match the pattern of a YouTube URL. Takes action based on the content passed in from an extractor. The gadget spec includes client-side logic and UI. In the YouTube gadget, the gadget spec accepts the YouTube URL and draws a thumbnail view of the video at the bottom of the email, which you can click to play the video–right inside Gmail. 2.Choose one or more pre-canned extractors. This determines which type of content will trigger your gadget. 3.Write a manifest for the gadget. 4.Write the gadget spec. This determines what the gadget will do when it is triggered. 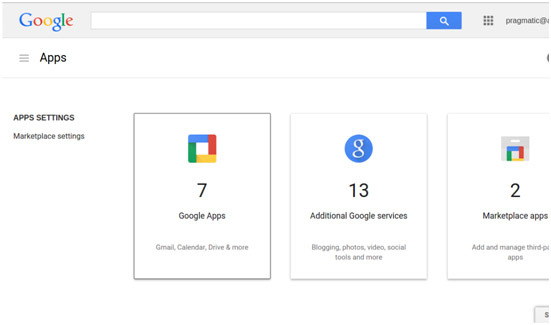 Google Apps Marketplace contains enterprise applications that can be added to a Google Apps domain. If you are an application developer, you can publish enterprise apps to the marketplace for others to use. 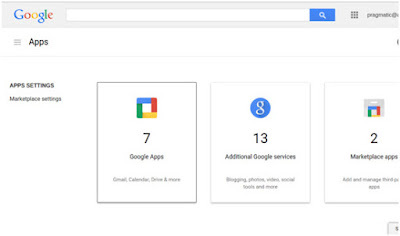 If you’re an enterprise admin for Google Apps, you can discover and install new apps from the marketplace. To publish “Google marketplace app” we have to create Google app account and also have to register domain. Goto console.developers.google.com and login with gmail business domain administrator account. Select configuration from Google apps marketplace sdk and give required information, like, App icon, app name, description etc. Now login with your business account domain administrator and select the gadget from Marketplace Apps. Click on Go button. It will check this will search for lead and if email id is found in lead will show lead info. If that email id is not present in odoo lead then it will open create lead form. Fill these information and click on submit will create lead in odoo.